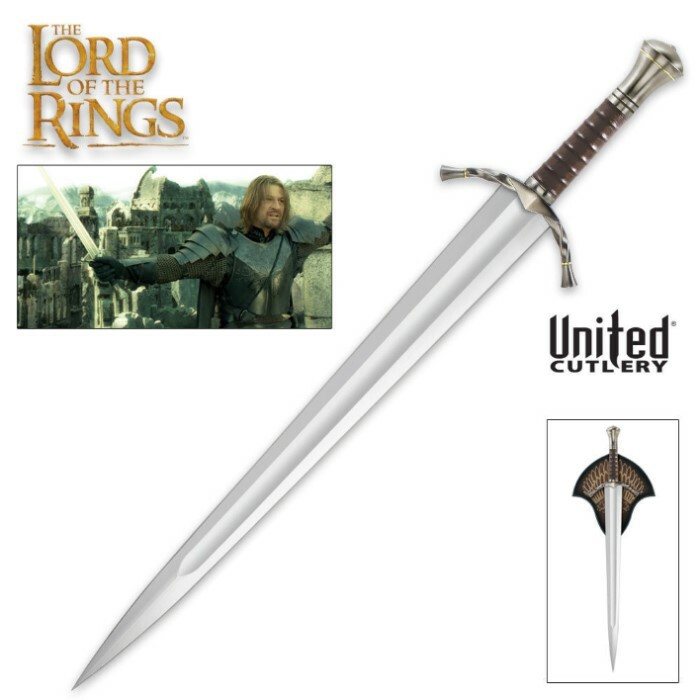 Officially licensed Sword of Boromir from The Lord of the Rings! Add this officially licensed collectible to your collection today. This True Favorite features a broad, heavy stainless steel blade with a false edge and extra-wide fuller. It was constructed to match the actual filming prop used in the blockbuster motion picture exactly. The ornate hilt and hand guard feature authentic embellishments and superb attention to detail. Like all officially licensed LOTR collectible replicas, the Sword of Boromir includes a wooden wall mount display plaque and a certificate of authenticity attesting to its rarity and prestige. I've always been a fan of Boromir's story within the LOTR and seeing him in live action was great. I was a big fan of his sword as well, but at the time of the first release I was unable to purchase it. When I saw they were bringing this back I was beyond excited! Overall the build and quality of the sword is terrific. The pommel really gives balance to the sword when holding it. My only issue with the sword is that the blade was placed the wrong way. Usually with my past replicas the leather stitching and the lord of the ring stamp are on the same side, so when you hang the sword it is clean looking. It is the reverse for my sword. It isn't a problem really, but just me being a little particular about it. Everything else (certificate and plaque) look great and arrived safely. I got this during a great sale and I can't recommend it enough to LOTR or Boromir fans! Overall this sword is of good quality. It feels really sturdy, it's balanced really well if you like to hold it from time to time, and the accuracy is quite good as is most Lotr/Hobbit UC replicas. The only problem I've encountered with this sword is the pommel. I received three of these swords trying to get a good one. First one had a VERY crooked pommel, the next one still had a pretty crooked one, and then I got the one I have now. It was opened up and inspected before being shipped to me. I was assured nothing was wrong with the pommel on this one but regardless this one still has a slight curve to it. I don't think the people inspecting them do it from a collector's point of view. It's not so bad to where most will notice, especially if it's just hanging on the wall and you aren't looking for it...but nevertheless it is still there when it shouldn't be. Bottom line this sword is really hard to find normally, so this may be your only/last chance to get one at a decent price. If you need it for your collection then you should go ahead and grab it, but don't expect it to be perfect or you will be disappointed. *side note* the plaque is nice, but the holes on the front of it were not perfectly even so I had to put something under one side of the guard so it wouldn't hang on at a slant.